When it comes to Ontario golf, Deerhurst Resort has it all: two 18-hole Huntsville golf courses, a golf academy for all ages, complete tournament planning and Muskoka's best value membership packages. 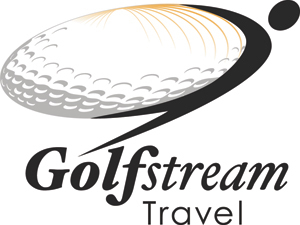 All within steps of everything that Ontario's most complete vacation and conference retreat offers for golf getaways and group events. Deerhurst Resort is renowned for many reasons, but Deerhurst Highlands Golf Course is what separates the resort from others in the golfing world. In 1990, Robert Cupp and Thomas McBroom co-designed this par 72 championship golf course, and immediately it established the benchmark for golf courses in the region, spark Muskoka's emergence as a major, must-play Canadian golf destination. 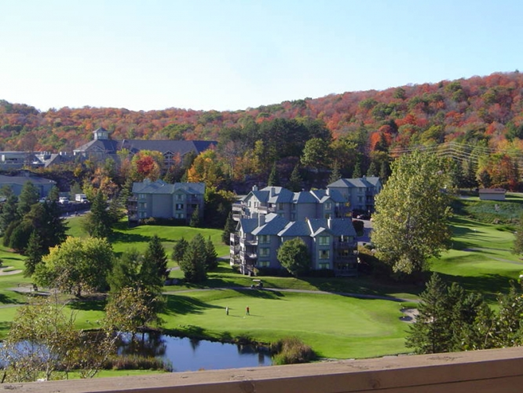 Ranked as one of Canas’A TOP 100 GOLF COURSES OF 2012 by SCOREGolf, Deerhurst Highlands continues to remain one of the top golfing destinations in Muskoka. Course is closed for the season, see you in 2015! Taking full advantage of the dramatic landscape while capitalizing on elevation changes, rugged granite outcroppings and dense forests, Cupp and McBroom created a design that is a genuine representation of the region, while maintaining a highly playable, well-balanced course that has stood the test of time. Despite its pro-level challenges, this 7,011 yard course is rewarding for a variety of playing levels. 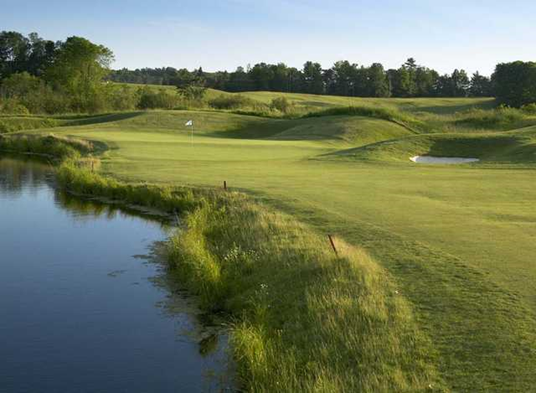 With 6 different tee deck levels including ladies, juniors and seniors, Deerhurst Highlands provides a golfing experience that is inclusive to a wide range of golfers. With a full service Pro Shop, golfers’ lounge and on-course food and beverage service to round out your golf experience, Deerhurst Highlands is committed to providing you with ultimate Muskoka golf experience. 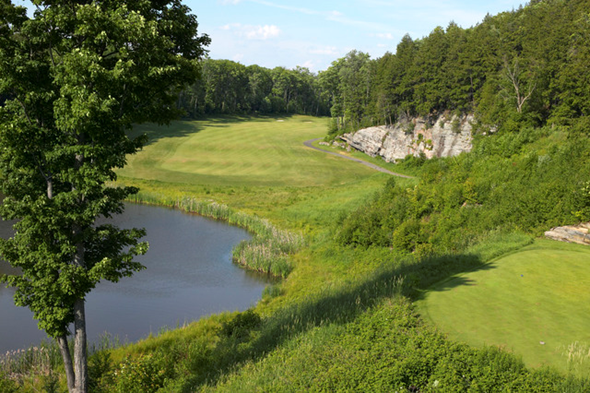 6th in the Ontario Golf's 2011 "People's Choice Category"
From the first elevated tee overlooking Fairy Lake the par-72 course takes full advantage of the rugged beauty of the Canadian Shield. It’s a bit like stepping into a Group of Seven painting. Bold granite outcroppings and dramatic terrain shifts are epitomized on the tenth signature hole with a sheer granite rock face in play along the length of the fairway. Inevitably, my ever-reliable slice produces an undesirable ricochet. Except for the open links-style holes four, five and six, the course is a precipitous and muscular romp—not for the faint of heart! Fortify yourself with a protein bar. To restore your confidence, take a swing at Deerhurst’s gentler, shorter Lakeside course, a par-64 that meanders around Peninsula Lake. Deerhurst Lakeside - Muskoka Golf's "Hidden Gem"
The original course was built in 1966, designed by respected Canadian architect C.E. (Robbie) Robertson, and was then redesigned by Thomas McBroom in 1988. The course redesign made Deerhurst Lakeside into one of Canada's truly unique resort courses. The front 9 sweeps around Sunset Bay before making its way to the back nine, which gives way to picturesque views of the surrounding countryside as well as Peninsula Lake. True to the Muskoka landscape, you will find yourself hitting from elevated tees, approaching slick undulating greens from deep valleys, while being challenged by strategic water hazards and deep bunkers. 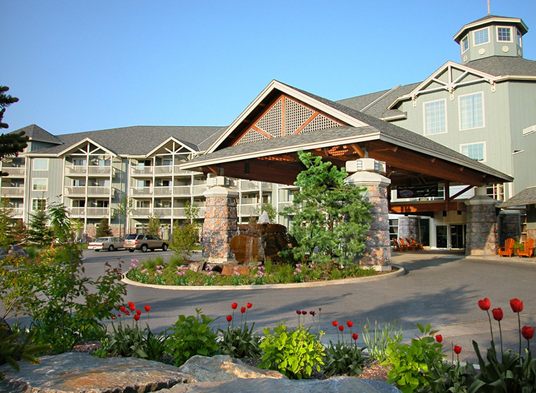 Deerhurst Resort offers ideal family accommodation in Huntsville with a wide range of fresh, newly updated styles. Up to two children 18-and-under share their parents’ room or suite at no charge. Select from a wide range of sizes and styles to fit any preference. 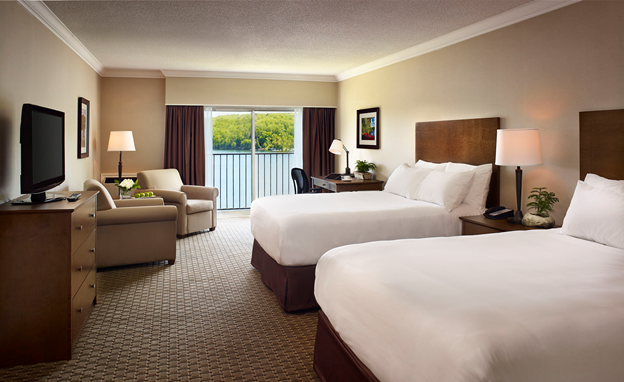 Many of our accommodations are newly renovated, and all guest rooms feature comfy beds, feather duvets and feather pillows. For those who require hypoallergenic bedding, please make your request prior to arrival. 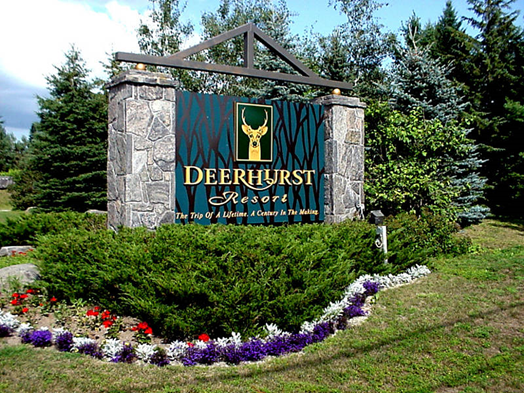 Located just a short 5 minute drive from downtown Huntsville and 45 minutes from Algonquin Park, Deerhurst Resort is the ideal selection for your Ontario vacation. 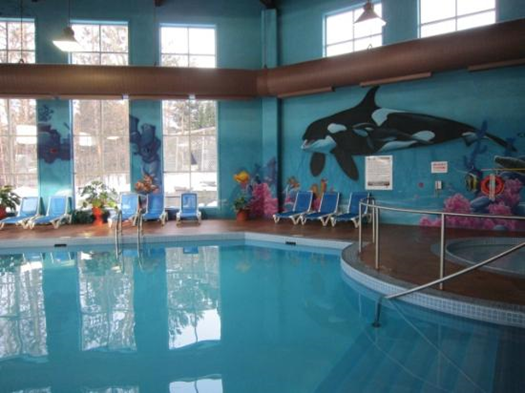 These welcoming Muskoka hotel rooms are conveniently located in the Pavilion, just a ten minute walk from the lake, and offer one king or two queen beds. These cosy yet polished guest rooms come complete with a desk area with complimentary high-speed wired Internet access, separate vanity area and most have a balcony or terrace. These smartly renovated Summit Lodges 1-Bedroom Suites are close to the Main Building and just a ten minute walk from the lake with a balcony view. These Huntsville accommodations feature a separate bedroom with TV and one king or two double beds. A convenient kitchenette includes a two-burner stovetop, microwave, mini-fridge, dishwasher, toaster, kettle, coffee maker, pots, pans, dishes and cutlery. 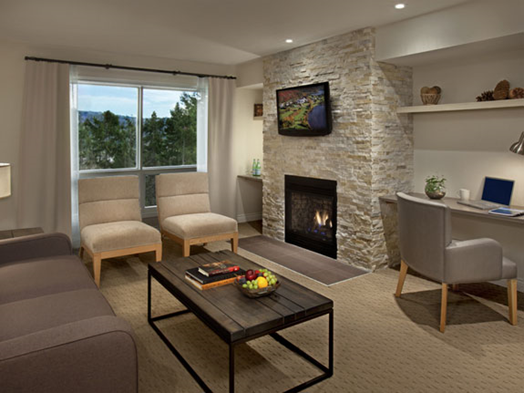 Relax in a separate living area with fireplace and complimentary high-speed wireless Internet, stereo, TV and DVD player. Please note layouts and decor may vary. 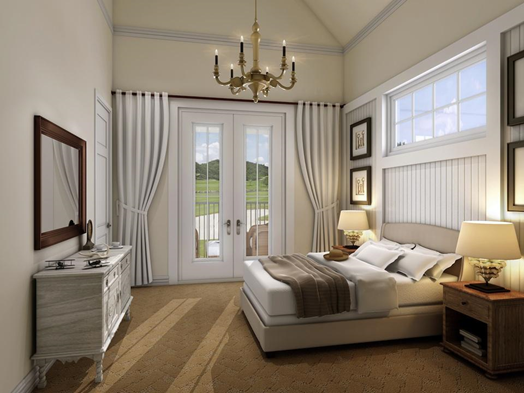 Lakeside Rooms - Freshly Renovated by the Beach! These hotel style rooms are conveniently located right at the beach offering an excellent view of the lake, steps from the waterfront activities and just a five minute walk to the Main Building. Newly renovated as of May, 2013, these spacious guest rooms sport a fresh look with clean modern lines combined with soothing earth tones and a mix of naturally inspired textures that echo the surrounding Muskoka landscape. Relax in comfort with two queen beds, a sitting area, work desk and one brilliant view of the lake, which is just steps from your room. 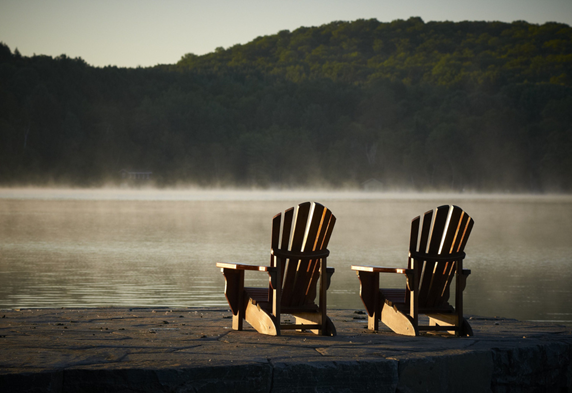 Our beautiful condos are the perfect choice for your next Muskoka getaway. Located just a short 5 minute drive from downtown Huntsville and 45 minutes from Algonquin Park, Deerhurst Resort vacation rentals are the ideal selection for your Ontario vacation. Deerhurst's condos are fully equipped with everything you need for a fuss-free stay without daily housekeeping. Please click the "Book Here" button for availability. Set in beautiful Muskoka, our hotel spa provides an intimate and private setting for your wellness escape. Experience the place where harmony and relaxation not only meet, but also work in tandem to help you achieve complete and total well-being. Inspired by the Japanese word for 'nature,' Shizen Spa offers guests the best amenities designed to indulge the five senses. Enhance your stay with a treatment package custom designed just for you. Shizen Spa offers, 8, 000 sq. ft. of wellness and relaxation, six full-body treatment rooms, five pedicure & three manicure stations, intimate couple's massage room, steam room, swimming pool and whirlpool, we look forward to welcoming you. Whatever adventure you seek - from summertime splashing in the lake, winter sports or off-road adventures - with all that our 760 acres offer, your Ontario getaway at Deerhurst Resort is guaranteed to be unforgettable. 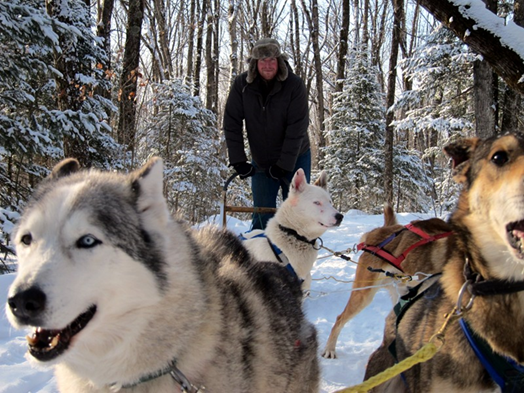 Enjoy everything from exceptional golf , boating, Treetop Trekking and horseback riding in summer to skiing, snowmobiling, sleigh rides, skating and dog-sledding in winter. Be sure to explore our local town of Huntsville with its Group of Seven Outdoor Gallery and unique shops, just minutes away. 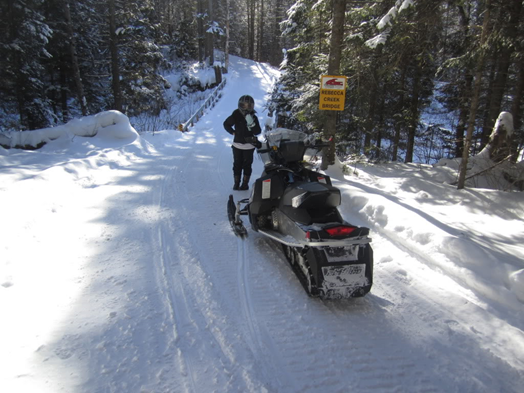 The sheer scope of activities and things to do right on property is unmatched by any other Ontario resort. Discover the delicious tastes of Muskoka dining. 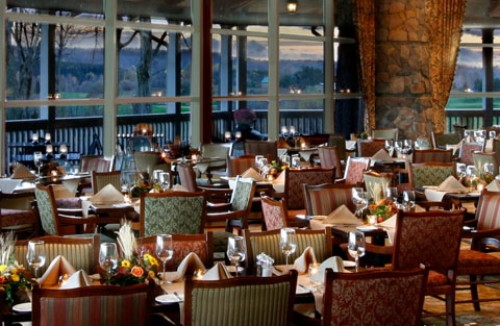 The restaurants at Deerhurst are committed to the "eat local" food movement. Director of Food & Beverage Rory Golden has been a true advocate for Ontario growers and producers, assisting in the foundation of the Savour Muskoka culinary trail. Now, new Executive Chef, David Bakker is continuing and furthering that trend working with 20 local food producers. Seasonally, Deerhurst harvests its own honey, herbs, shiitake mushrooms and maple syrup right at the resort. Nestled on 800 acres of rolling, wooded countryside on Peninsula Lake in Muskoka, Ontario, Deerhurst Resort radiates the charm of its natural setting and rich heritage. Famed for its 1,600 fresh water lakes and striking granite outcroppings, Muskoka has been a celebrated vacation retreat since the 19th century. Nearby Algonquin Park, immortalized on canvas by Canada's most acclaimed artists, the Group of Seven, offers a legendary Canadian wilderness experience. Since 1896, Deerhurst Resort has made the most of this year-round natural playground setting with a full palette of leisure pursuits, guest comforts and engaging service. The centrepiece is the Pavilion, where guests enjoy full amenities under one roof - a newly renovated hotel wing, elegant conference centre, restaurants, art gallery, lounge, pool and a full service spa. Clusters of low-rise condominium style accommodations are tucked throughout the resort landscape by the lake, ideal for families or a getaway with friends. 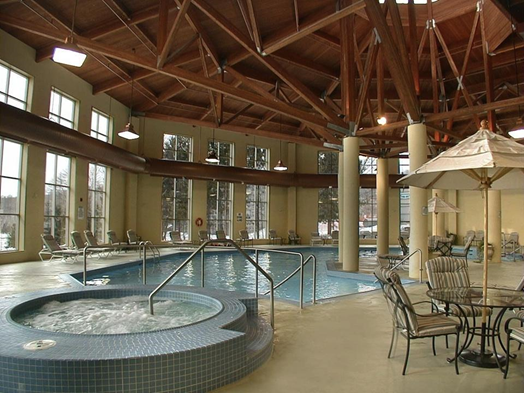 Best of all, Deerhurst Resort is easy to reach… just two hours and two turns from Toronto, and easily accessible from other Canadian cities, including Ottawa.